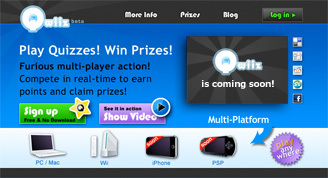 Qwiiz is a massively-multiplayer multi-platform quiz game. It has been designed to work in all major browsers included those packaged for the Apple iPhone/iPod touch and Nintendo Wii. People will be able to play at work, at home on their console or anywhere they choose using a mobile device. Trialled on large company intranets, Qwiiz has evolved to take advantage of the very latest technologies. We use CometD for realtime push-based communication and Cloud Computing for scaleable and reliable hosting. The challenge of creating Qwiiz was to design something that would work within the latencies inherent in the wide world web while supporting thousands of concurrent players. Qwiiz is about to go into a stealth beta release phase.